Javier has always been very attached to Michelle. Even though he spends much more time around me, Lorenzo and Cachita used to guard me and try to prevent him from getting too close to me when he was still a puppy. So naturally, given no other option, Javier got much more attached to Michelle. And then when Cachita finally warmed up to him, he got really attached to her too – almost like a second mommy. Back in June 2011 in my article "Waiting for Mommy", I shared a photo of Javier waiting for Michelle by the window of our old place on Oak Park Avenue. 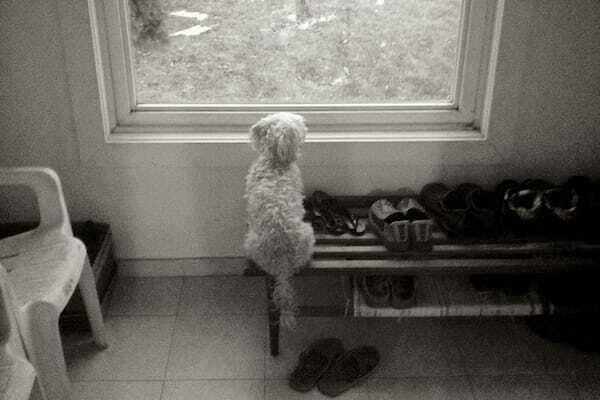 I took a similar photo this past January when Javier decided to jump up onto our shoe rack so he could look out the window while waiting for Michelle to get home. 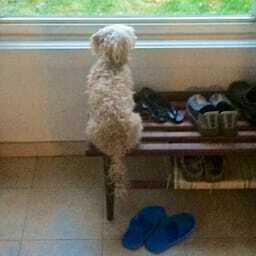 Michelle gets home around 5:30 every day, but by 5pm, Javier would be looking out the window waiting for Michelle. After Michelle stays home for a long weekend, and especially after she takes vacation time and is around more often, Javier takes a couple days to get used to her not being around as much anymore. That photo from January was after him spending three solid weeks with Michelle (in Calgary) during the holidays. This past weekend, Michelle went up to Woodbridge to visit her family and given the more than two hour bus ride to get there, I suggested she take Cachita along for company. Needless to say, Javier was very sad to have both his mommies gone. I was sitting on the couch and rubbing his belly when they left, but he managed to escape my arms and ran to the mud room, looking out the screen door as they walked away. I hadn’t heard Javier cry like that in a very long time! He was so sad to see them leave without him, and crying so much that he even started to howl! I’ve shared videos of Javier crying before, ("Javier Crying for Cachita" back in July 2010 and "Doggies in the Car" back in March 2011) but this was nothing like that. This time he was actually howling, "aaah-ooooooooooh!" Very sad but kind of funny at the same time. Too bad I didn’t get it on video. So just as I was getting this article together, I realized that I’ve never shared a video I have from November 2009 of Javier crying and howling. How have I not uploaded that yet? Javier was fifteen months old at the time and it was a similar situation – Michelle had taken him on a short afternoon walk and then dropped him off at home and returned for Lorenzo and Cachita. I wasn’t sure if he was sad that he didn’t get to go with them, sad that Cachita was gone, or sad that Michelle was gone. It was probably a combination of the three. You can hear profound sadness in his howls, no? What can I say, he’s such a Momma’s Boy! Momma’s Boy was published on Wednesday, August 7, 2013 at 12:45pm EDT by Daniel Menjívar and last updated on April 11, 2018 at 9:30pm UTC .